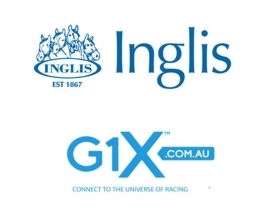 Inglis is delighted to announce G1X.com.au as a media partner for the Inglis Premier Yearling Sale. to be held at Inglis’ Oaklands complex in Melbourne from the 28th & 29th February and 1st & 2nd of March. G1X.com.au will host a live stream of the Inglis Premier Yearling Sale, along with comprehensive video news and unique and engaging feature stories, presented by the G1X team. The G1X.com.au coverage will highlight the stories behind the sale, tapping in to many of the colourful characters of the bloodstock world during lead up events, inspections and throughout the four days of the Premier Yearling Sale. As part of the partnership all G1X.com.au content relating to the Inglis Premier Yearling Sale will be accessible via all Inglis Digital properties including Bloodstock.com.au, StallionParade.com.au and GetRacing.com.au. G1X.com.au is a national, independent digital racing channel offering members free subscription to premium video content, racing news, views and tips.